In addition to owning a home security system, there are many things you can do to make your home as safe as possible! Protecting your home with a monitored home security system from S.C.I. is just the first of many valuable home security measures. Below are some general home safety tips that will keep your home and family safer. When you leave your home for a long period, give your home a lived in look. You can put your lights on timers, leave a television on, or have someone stay at your home while you are away. Check to see if all of your doors have good, updated locks that work properly. If not, replace them immediately. Never leave extra keys or garage doors openers under doormats, in mailboxes, or on top of the door frame. Instead, leave an extra key with a close friend, neighbor, or family member who you trust. You can make any windows or sliding glass doors extra secure by laying a piece of wood or metal along the bottom track, preventing the window or door from opening from the outside. Always keep garage doors shut. Store expensive jewelry, electronics, and important documents in a safe at home in a central location of the home. Never leave a note on the door when you are away from home. This is a clear signal that no one is at home, and a nice invitation for any criminal to come inside. When you are away for extended periods, ask a neighbor or family member to collect your mail, newspapers, and any deliveries you may have collected. Install a peephole in your front door so you can see who is outside before letting them in. Try to use fire resistant materials when building a new home. Never leave candles, or any other open flames unattended in your home. Make sure cigarette butts are completely out before throwing then in the trash. Never leave hot irons, curling irons, grills, and etc. unattended. Keep your roof clear of all leaves and pine straw, especially during winter months where fire places are being used. Install smoke alarms on each floor of your home, check batteries regularly, and test them at least once per month. When cooking, don’t leave pots or pans unattended on the stove. When frying foods always have baking soda or a fire blanket handy to extinguish grease fires. Make sure you and your family has a fire escape plan. Practice the plan and make sure everyone in your home knows exactly what to do in case of a fire. Ensure that your street address is easily visible, allowing emergency personnel to find your home quickly. Ask us about our $99 Security System Package! 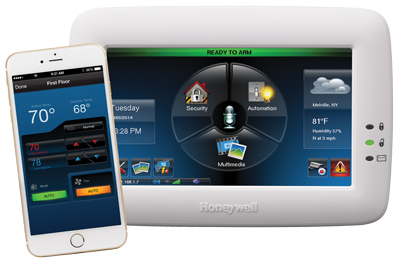 Control your home with a high-resolution graphic touchscreen and controller that can integrate security with home automation. Let your home adapt to you with a wireless connected platform that helps make your home safer, smarter and more enjoyable than ever.